The rookie cop who was still on probation when he shot and killed an unarmed suspect in December, is likely to escape criminal charges, according to several use-of-force experts. Nonetheless, most agreed that a 30-second video shows apparent and significant breaches of procedure, and one of the experts felt these were major enough to warrant firing the officer who is in his 12-month probation period. During probation, rookie officers are not protected by the union contract and can be fired without cause. Lewis said he believes the officer should be fired for his actions. Others were more cautious, but pointed out significant lapses in procedure during the incident that took place Dec. 1 after a chase that started around 10:30 a.m.
On that day, Officer Chris Samayoa had been on the job only four days when he shot and killed 42-year-old Keita O’Neil. The incident began after O’Neil carjacked a California State Lottery van and led police on a chase through the southeastern corner of the city. The officers eventually pursued him into a dead-end street. At that point, O’Neil fled the van. He ran past the patrol car where Samayoa sat in the passenger’s seat and a training officer was at the wheel. Without lowering the window or shouting a warning, O’Neil shot and killed the suspect. 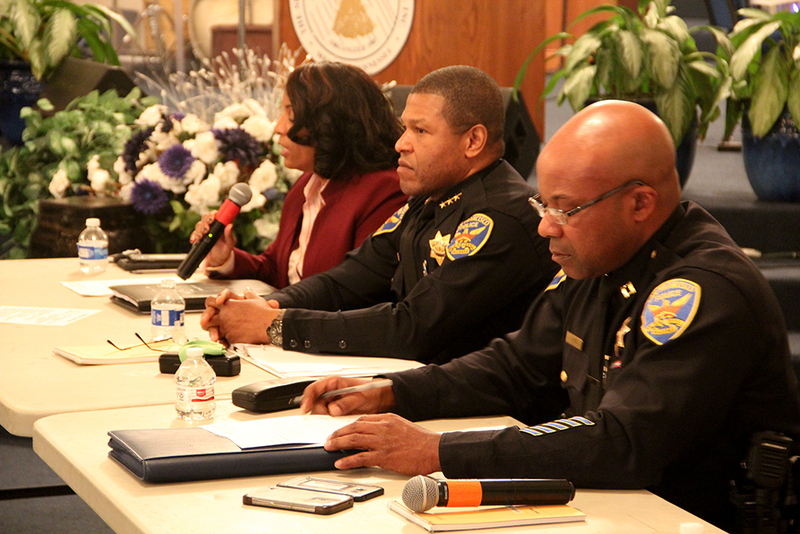 Mission Local asked four police use-of-force experts to examine the video. Samayoa’s state of mind, they said, is the standard through which any use of deadly force is investigated and deemed “reasonable.” It is this bar that has consistently made police shooting cases difficult to prosecute. Michael Leonesio, a former Oakland Police Officer who has investigated numerous use-of-force incidents, said that after viewing the body camera footage, he had two main questions. He said without seeing Samayoa’s statement about the shooting, it is impossible to know whether Samayoa perceived a threat. He said it’s too difficult to tell what O’Neil is doing in the video to say objectively that O’Neil was not a threat to Samayoa. However, Leonesio pointed out that Samayoa may have had his finger on the trigger prematurely, as he noticed the hammer had been pulled back a second before the shooting took place in the footage. That led him to wonder whether Samayoa accidentally fired under stress. Leonesio noted, too, that other officers shown in the video did not have their guns drawn immediately following the shooting. This, he said, also raised questions as to whether O’Neil had actually posed a threat. But, he said, it all comes down to what Samayoa, and not the other officers, saw. In other words, an investigation hinges on what Samayoa tells investigators. “Without knowing what this officer’s statement is and other (training) officer’s statement is, it’s difficult to tell whether it was reasonable or not,” he said. Likewise, Seth Stoughton, a professor at the South Carolina School of Law and a former police officer, agreed with Leonesio that a major factor in determining the “reasonableness” of the shooting is whether Samayoa perceived a threat. To determine that, the body camera footage has to be viewed with Samayoa’s account in mind. Yet Stoughton too raised the possibility of an accidental discharge. He said one thing from the video was clear: Samayoa drew his gun while inside the moving patrol car. A patrol car could make a sudden stop — as it did during the incident — and an officer’s hand could tense up and accidentally fire his weapon, he said. “It makes me wonder more whether this was an accidental discharge,” Stoughton said. Stoughton also echoed Leonesio’s observations that other officers in the video did not have their guns drawn immediately following the shooting. Specifically, he said, the training officer who had been driving the patrol car walked around the car quickly without drawing his gun. However, Stoughton said it still leaves questions about what Samayoa perceived. The training officer’s behavior “doesn’t necessarily tell us about what passenger (Samayoa) perceived — it tells what the driver perceived,” he said. Jim Bueermann, president of the Police Foundation, said that Samayoa may have perceived a threat based on two pieces of information. Officers thought O’Neil committed a violent crime and he ran back toward the patrol car after exiting his lottery van. “I’ve never seen or heard of a suspect running back at police unless engaging in gun battle or with a weapon,” Bueermann, who was a cop for 33 years. No weapon belonging to O’Neil was found at the scene, but according to Bueermann, that does not matter. “It (police shooting at an unarmed victim) inflames the emotions of the community, but the fact that he was found to be unarmed at end of violent carjacking pursuit may not be relevant to a decision about whether officers actions are reasonable,” he said. Lewis, the SFPD Crisis Intervention Team trainer, found Samayoa’s use of deadly force unequivocally unreasonable, based on the information available to him. Lewis said he saw O’Neil running past the patrol car when Samayoa fired and therefore was not an immediate threat. “There’s something broken in the system of accountability and checks and balances,” he said. Samayoa was four days into his 12-month mandatory probationary period when the shooting took place, which means that he is an “at-will” employee and Chief Bill Scott can fire him without a vote from the Police Commission or a so-called “Skelly hearing,” when public employees in California are given a chance respond to allegations related to their termination. Samayoa is currently on paid administrative leave. “The Chief elected to not return Officer Samayoa to duty at this time, pending additional information from the investigation,” David Stevenson, the director of strategic communications for the SFPD, wrote in an e-mail. A member of the department, who asked to remain anonymous because the member is not permitted to speak freely on the matter, said that it’s unlikely Samayoa will get fired. An officer-involved shooting has never been deemed a wrongful shooting – at least not to the police officer’s knowledge. Moreover, firing an officer and charging him with homicide would set a precedent that opens door to officers being arrested for similar situations and set off a wave opposition among department membership, the officer said. A police shooting triggers five investigations: two by the SFPD including one by the Homicide Division and one by Internal Affairs; one by the District Attorney; one by the Department of Police Accountability and one by the Medical Examiner. The District Attorney’s office is supposed to be the lead investigator, but so far, the Police Officers Association, the police union, has been able to block that change. It’s nearly impossible to get a timeline on any of the investigations. Although several outside groups have called for faster investigations, most take 22 months or more. District Attorney George Gascon has so far declined to file charges in any case in which police have killed civilians. The investigations underlying a decision against charges have been completed in 11 of the 20 cases in which police have killed civilians since 2011; nine cases including Samayoa’s, remain open. The length of the investigations raises the question as to whether it will take so long that Samayoa will be off his 12-month probation period, making it harder to fire him without cause. One source pointed out that the SFPD contract does allow a probationary period to be extended, but it is unclear if that will happen in this case. In addition to the various investigations, Samayoa has been sued by O’Neil’s mother, who is being represented by John Burris, a civil right attorney. The lawsuit, filed in U.S. District Court, alleges that Samayoa’s actions resulted in the wrongful death of O’Neil. It alleges that O’Neil did not pose a deadly threat to Samayoa or the public when Samayoa “willfully and intentionally” shot O’Neil through the patrol car’s window. The lawsuit alleges that the patrol car was moving when Samayoa fired, a violation of SFPD policy. The complaint, too, points out that Samayoa and the training officer did not activate their body cameras before the incident, also a violation of SFPD policy. The video was captured only because the cameras are programmed to capture 30 seconds of video preceding activation, and Samayoa turned it on immediately after the shooting. Since the shooting occurred in December, Bayview Captain Steven Ford has been holding weekly meetings aimed at comforting the community about the incident. But at the most recent meeting on January 22, the only people in attendance were two producers from KTVU, a reporter from Tsing Tao Daily, this reporter, and one community member. Phelicia Jones, founder of the Justice for Mario Woods Coalition, a group that advocates against police violence, said she doesn’t know why the meetings have seen such low attendance, but said the department could do better to spread the word. Jones said that one thing might help the community feel better. I was under the impression, from earlier ML reporting, that the meetings Ford is holding in Bayview are not about “comforting the community” but ending the insane SFPD practice of sending rookie cops to “train” in Bayview, a flash point for racial tensions and violent police confrontation. This is not a public relations problem, or an accountability problem. It perpetuates, as pointed out by the DA’s Blue Ribbon Panel, racial bias and “warrior” mentality within the SFPD. Struggling to see what this has to do with the mission. Bayview is not the mission. If you’re going to start covering topics beyond the Mission maybe consider a rebrand starting with a new name? Might I suggest ‘MEDA Mouthpiece’? Edward: To the extent that we can, we’re trying to cover the police reform efforts. Those have a huge impact on the Mission, but they go beyond the Mission and so when we can follow up on something beyond the Mission we do. We aren’t a mouthpiece for anything except reported news. I would like to clarify that my comments on this tragic shooting represent only my own views and not the SFPD Crisis Intervention Team (CIT) training program that I work with. I have not discussed the shooting with this working group and thus do not currently know the views of its other members.